As I have travelled across the country – Victoria to Peterborough – there has been lots of musing, reflection, laughter and tears…. This is what happens when you spend 5 days in a car with a life long friend. We have been amused by various road signs along the way – on Mount Revelstoke there were several ‘watch for amphibians’ signs – and we wondered what amphibians we are on the look-out for!?! Especially since the snow was still on the mountain. 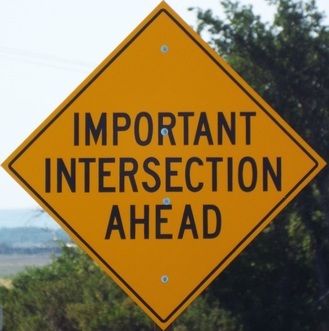 There have been merging signs, large Liquor signs, and perhaps one that has stood out – “Important Intersection ahead”. As we crossed the prairies, we would drive long distances without a sign of much life, let alone other cars or buildings. Every so often a road would join the highway and at that point, a flashing light was visible a long way in the distance, and as we got closer we saw the infamous sign –"Important Intersection ahead". The light and sign gave travellers a ‘heads up’ that something was about to happen – a truck or other vehicle may be joining the highway. I have been reflecting a lot on purpose on this journey - both on my own and as we have chatted together. I think that like the sign – I find myself again, at an important intersection. It’s a time of joining, of altering my path, of watching for flashing lights and big signs, while still moving forward. We, my friend and I, have been talking about how we want to contribute to this world – through our children, our spouses, our friends and family…but there’s more. What are the strengths we have been given to share with the larger world? Today one of the books we read encouraged us to think about when we felt energized during the day and to contrast that with when we felt depleted. Often our strengths play out in the arena of positive energy, our weaknesses can make the work feel like we are walking through deep, muddy water. Is it possible that what gives us joy, might be the best clue to our purpose? Is it possible that we are wired to delight in our purpose, to thrive in our calling? I think when we see a light flashing and find ourselves at an important intersection, it’s a perfect time to consider our purpose. Stuff, junk and…still to be sorted!